While I have wondered before what sort of money those gold places would give for unwanted jewelry, I hadn't noticed how prevalent those storefronts are. Three days after the episode aired, my husband and I were all over town on errands and he pointed out quite a few of them - and there are two in/adjacent to our local mall. 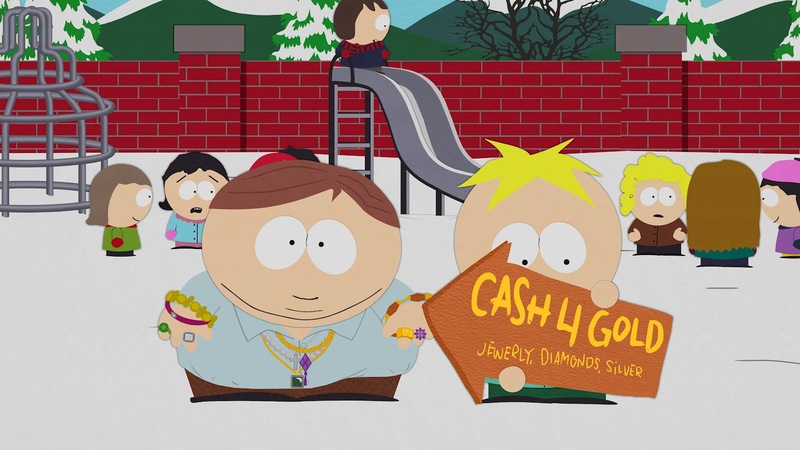 I thought that the highlight of the episode was the exposed life cycle of jewelry, but I'm always a fan of a good Cartman scheme as well. So, although it's not going to go down as a South Park great, it's amusing enough to watch more than once, so let's call it a win.